Nail Art : If you don’t have the proper tool… you can make one! 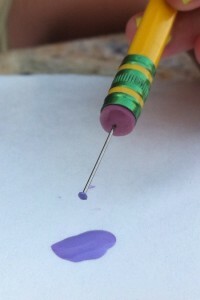 If you’ve seen my “Nail Art” videos and you don’t have a dotting tool… now you can make one yourself! It’s easy, just use a pencil (with a rubber end) and a pin. Tribal Print Nail Art – YouTube. Chic Newspaper Nail Art – YouTube.